Note: For a short summary of the following in-depth investigation and analysis, visit this page. 2.3.7.1 Earlobes vs Curly hair locks? * In some FIGU books and articles (FIGU Bulletin Nr. 16, FIGU Special Bulletin no. 64, FIGU Special Bulletin no. 75, Und sie fliegen doch!, pg. 337, 2012, Verzeichnis, 1991), the Asket-Nera photos were mentioned to have been taken on June 26, 1975 instead of July, which probably are typos. 1982 – Wendelle Stevens has published these three photos in black & white, on pg. 125 and pg. 542 of his book ‘UFO Contact from the Pleiades: A Preliminary Investigation Report‘. 1983 – Lee and Brit Elders have published photo #110 on pg. 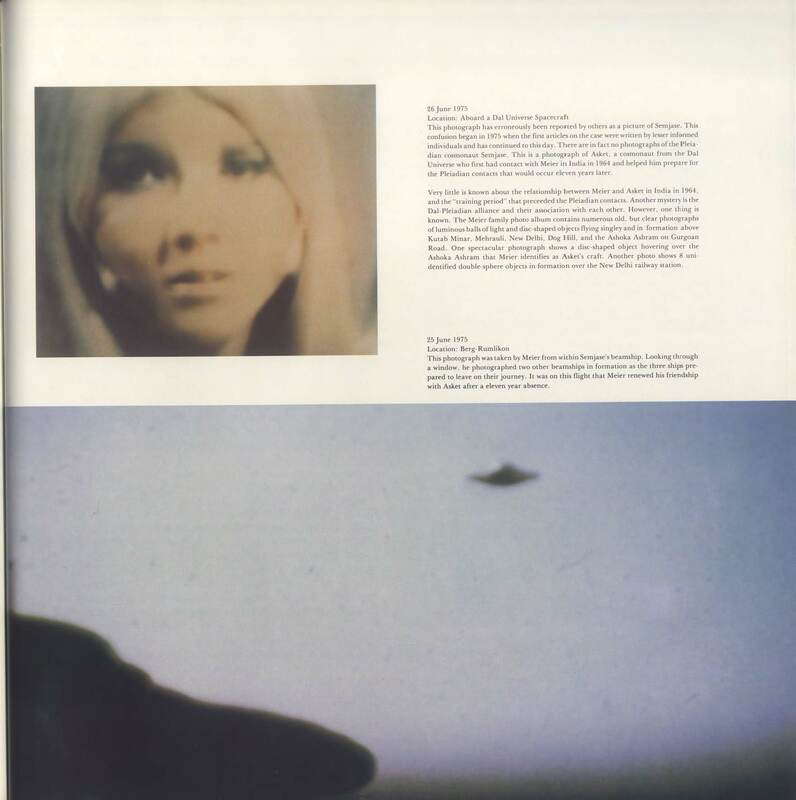 67 of their picture book ‘UFO… Contact from the Pleiades Vol. II‘. 1991 – FIGU co-founder and Core Group member Guido Moosbrugger published photos #110 and #111 as images 4 and 5 in the photos-section of his book ‘Und sie fliegen doch!‘. 1997 – Billy Meier has published the photo #110 in the photo section of his book ‘Aus den tiefen Weltenraums… Kontakte mit den Plejadiern/Plejaren‘. And following is an incomplete list of documentaries or video lectures in which the Asket-Nera-Semjase pictures have been promoted as genuine pictures of extraterrestrial women. In Meier’s photo catalogue Verzeichnis the name of extreme right person in the photos #109 and #111 is not mentioned, but based on the information in CR 31 it could be no one else but Semjase, who explicitly stated to Meier that she doesn’t want her face to appear in the photos available to people other than Meier because she doesn’t want to be recognized while executing her mission on Earth, which could be the reason why her face has been masked. In photo #110, the person to the left of Asket might be Semjase because in the other two photos she is the only person who appears to have straight, dark or black hair. An original scan made of photo #110 as sold by FIGU is available here. Since Semjase only appears partly on these pictures, these are generally referred to as the Asket-Nera pictures (which will also be identified by us as such) instead of the Asket-Nera-Semjase pictures. First we will discuss what skeptics, Meier/FIGU and their supporters say or have said on these photographs and after that our own analysis follows on topics that haven’t yet been addressed by the aforementioned groups. Col. Colman S. von Keviczky (1909-1998), an internationally prominent ufologist and Hungarian military scientist, founded ICUFON (Intercontinental U.F.O. Galactic Spacecraft Research and Analytic Network) in 1966. He originally published a report (see pages 114-120 of the book – Ausschnitte aus Zeitungen und Journalen) on the Meier case, which was sent to Wendelle Stevens and Thomas K. Welsch of Genesis III Productions, Ltd. on June 9, 1980. Following is a scan of pg. 5 of the report which is available on pg. 120 of the book ‘Ausschnitte aus Zeitungen und Journalen (AZJ)’, that covers the Asket-Nera photos. The photograph which Colman von Keviczky was referring to is Meier’s photo #109. Mr. Keviczky incorrectly refers to Asket as Semjase and Nera as Asket. In March 1981 Kal K. Korff, with editorial assistance from William L. Moore, published a booklet titled The Meier Incident: The most infamous hoax in Ufology. On page 26 of this 124 pages booklet Korff presents his findings, as shown below. Since Korff got the photo from ICUFON (Colman von Keviczky), Korff also incorrectly refers to Asket as Semjase and Nera as Asket. While Mr. Keviczky claims that the features of the person on the left in #109 (Asket according to Meier) are ‘similar to Billy’s wife when wearing a blonde wig’, Korff on the other hand claims that the person on the right in #109 (Nera according to Meier) ‘bears an uncanny resemblance to Billy Meier’s wife when wearing a wig.’ Other critics have pointed out that they look like fashion models from the Sears Catalogue. 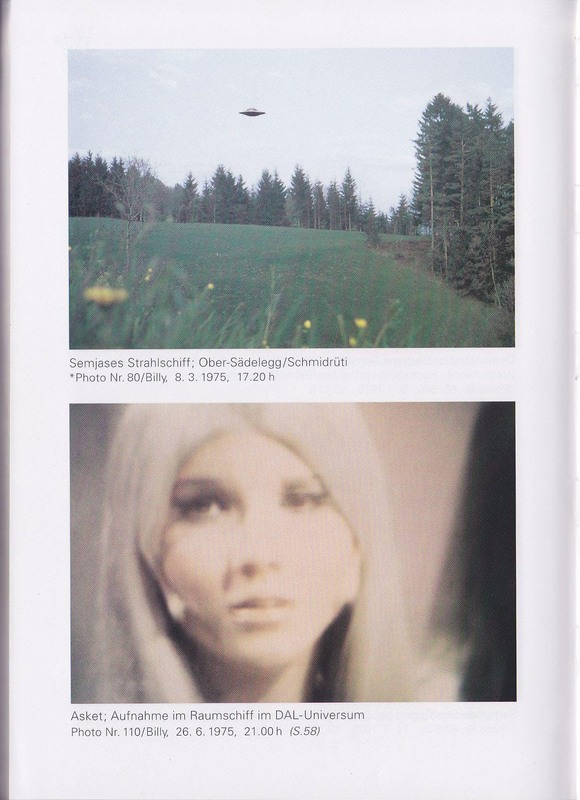 In his 1995 book, ‘The Billy Meier Story – Spaceships of the Pleiades‘, Korff presents his new analysis of the Asket-Nera photos on pages 244-247. In this book, he accurately refers to the persons in the photos as Asket (left) and Nera (right). According to the information shared on May 6, 1998 in the public mailing list dedicated to the study of UFO-related phenomena, it was Korff’s team which first discovered that the person in Meier’s pictures referred to as Asket was actually a dancer from the Dean Martin Variety Show originally broadcasted between 1965-1974. This revelation was first published in the article – ‘Billy Meier–Neue Hinweise und Geständnisse’ (Billy Meier–New leads and confessions) – in a German magazine, UFO-Kurier Nr. 43 on May 1, 1998. The English translation of some German excerpts from the article are available here. Korff reportedly traveled to Switzerland for a 2nd time in March 1998 (1st time was in 1991) and interviewed (with English subtitles here) Meier’s ex-wife Kalliope (divorced from Meier in 1997) with the help of Swiss UFO researcher and investigative journalist Luc Bürgin for his upcoming FOX TV show – “World’s Greatest Hoaxes: Secrets finally revealed“. During the interview she was shown some video excerpts from the Dean Martin Variety Show – Christmas Special from 1970, where she mentioned the similarity between ‘Asket’ and the Dean Martin show dancer named Michelle DellaFave “verblüffend” (astonishing). However when the FOX TV show was finally broadcasted on December 28, 1998, this Asket-segment wasn’t included in it. “Yes I am the person in the picture and I am with Susie and we were both Goldiggers and the original Ding-a-ling sisters, and I am not anyone but the real being in that photo, now that is a new one for my books, where did that come from?…I know nothing about the history about that photo, you must share some more, it is very amusing to me as an actress, I have done many roles but that idea has me thinking!!!”. I emailed her back with a summary of the history of the photographs, but received no further replies. Die Frau auf Meiers ET-foto bin definitiv ich! The woman in Meier’s ET-photo is definitely me! On May 14, 1998, after it had been revealed on May 1 that the woman ‘Asket’ in Meier’s photos is identical to a dancer from the Dean Martin Variety Show, Billy Meier published an article – Eine äusserst unerfreuliche Angelegenheit (An extremely unpleasant matter) – on the FIGU website. This article is now available in FIGU Bulletin 16 (June 1998) and also in Stimme der Wassermannzeit, Nr. 107, pg. 1-6 (June 1998). The official English translation can be read in the May 23, 1998 UFO Updates list as shared by Christian Frehner, or in the books And yet they fly, pg. 337-343, 2001 and And still they fly, pg. 282-288, 2004. Meier meets with Ptaah on May 14, 1998 (Contact Report 264) for clarification on the Asket-Nera photos issue. During the 264th contact, Meier was told by Ptaah that both he and Quetzal have met Meier on their 199th contact on February 3, 1985 and explained to him unofficially (according to Meier, only official conversations are documented the contact reports available to public) that the women in Meier’s photos were not Asket and Nera but the two look-alikes from the dance show, whose existence was already conveyed to him in CR 39 (1975). They only came to knew about this when they showed these photos to Asket in Autumn 1984, who then immediately recognized that the woman in the photos was not her, which led the Plejaren to investigate the matter. This fact however was forgotten by Meier due to his life-threatening condition and partial amnesia at that time. The Plejaren also didn’t pursue the matter further since then because they thought that Meier had taken care of it. After seeing Meier’s Asket-Nera photos a group called ‘Men in Black’ (or MIB) who ‘always had access to unfathomable resources‘, easily discovered their look-alikes in America, took photos from their film footage and coerced the photographer Schmid to do forgery (just like what they did with hundreds of Meier’s other photos) by selecting those frames which most closely resembled Meier’s photos of Asket and Nera. Meier received this photo material only months later and believed them to be originals. 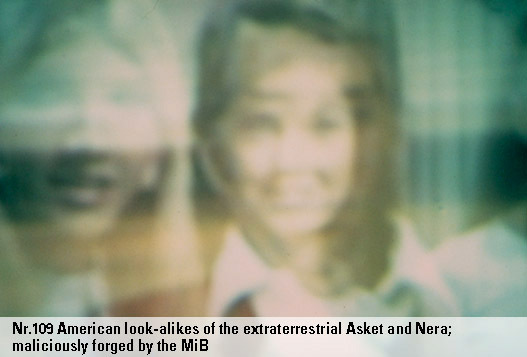 The MIB pre-progammed this Asket-Nera controversy (1998) in 1975, as they determined that the appropriate photo sequences would be found in the future. Another group comprised of malicious ETs living under the Giza pyramids, called the Gizeh Intelligences or Bafath, were also involved in this forgery, although Plejaren are unable to find their exact association. However for decades the Bafath have influenced a ‘vast number of (unsuspecting) terrestrials‘ in order to ‘harm, defame and even assassinate‘ Meier through their ‘negative telepathic impulses’. All the three photos #109, #110 and #111 will still be sold but with a different caption saying that the women in the photos are American look-alikes of the real DAL universe cosmonauts Asket and Nera. Meier also published two other articles – Dankesbrief an Luc Bürgin (Thank-you letter to Luc Bürgin), dated May 12, 1998, and Neue Korff-Bürgin-Intrige (New Korff-Bürgin Intrigue) – in the same FIGU Bulletin 16 (June 1998). In FIGU Bulletin 17 (July 1998), Meier published an article – Mordanschläge auf Billy am 8. und 10. Juni 1998 (Assassination attempts on Billy on June 8 and 10, 1998) – where he alleges that both Kal Korff and Luc Bürgin are partially to blame for these new assassination attempts on Meier, most likely carried out by the MIB who have influenced mentally unstable people to carry out their deeds. Meier also in Verzeichnis 1999 ed., contrary to the 1991 ed., has mentioned that the women in all the three photos represent doppelgängers of the real ETs Asket and Nera, maliciously inserted by MIB. FIGU Core Group member, Hans George Lazendorfer (HGL) has published an article – Asket und Nera (Asket and Nera) – in FIGU Bulletin 16 (June 1998). The English translation of this article can be read on the FIGU Canada website or on the Billy Meier Wiki futureofmankind. 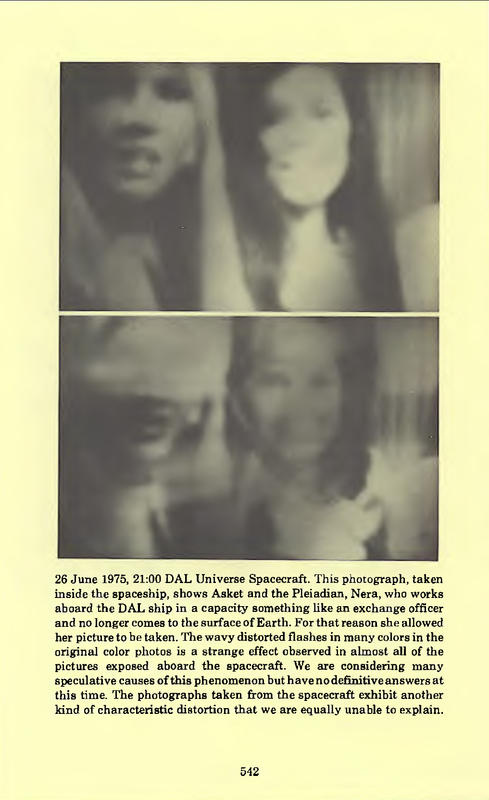 The Asket and Nera photos taken by Meier inside a Plejaren jumbo spaceship at 9 p.m. on June 26, 1975, are all forgeries. The look-alike faces and maybe other features of the two entertainers were copied into Billy’s original photos. This fact would be obvious when abnormalities are observed by making a thorough comparison of the pictures. Photographer Schmid, who is 65-70 years old in 1975 and whose picture FIGU still has, claimed he was from the Rhine-valley region and under the coercion of MIB, has through retouching, recopying, and “sandwiching” separate TV show sequences, adapted and arranged the photos to look the same as Billy’s originals which no longer exist now. Schmid kept his background a secret from Meier during the ~18 months of his long association with Meier, where in many instances Meier was never given back his original pictures. Then one day Schmid disappeared without a trace and since then never contacted Billy Meier again. These forgeries were done so perfectly, that not even Billy noticed the adulterations over the past 23 years, since the two female look-alikes in the photos have an extremely close resemblance to Asket and Nera, right down to the last detail, which was already mentioned in CR 39. Due to Meier’s grave accident in 1982 and the life-threatening state of health at that time which led to partial amnesia, Meier simply forgot to act against the forging schemes of MIB and the photographer Schmid, when it was revealed to Meier in 1985. 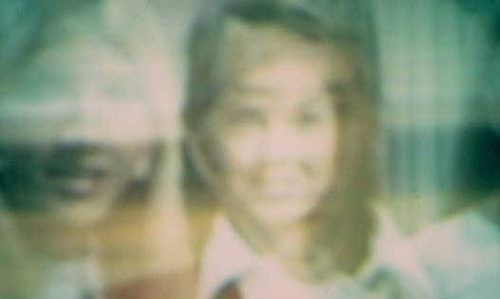 If the photos had been taken from a color TV monitor in the 1970s, any enlargements of the picture would invariably also show the 3-color grid of the cathode ray tube, which would show the colors blue, green and red arranged in three round or square colored light dots. This fact was previously investigated by FIGU’s photo technician, a printing specialist who worked with tenfold enlargements and other enlargement tasks – which was forgotten by the forgers as they got a little carried away in their work. In order to produce photo-sized pictures from a TV unit, Billy would have had to place his old Olympus 35 ECR camera directly in front of the TV, since this simple camera possessed neither an automatic light meter nor a zoom lens. The part of the Meier’s Asket photos which many people misinterpreted to be earlobes, are actually the small curls of the revue dancers since Asket’s earlobes cannot be seen on the photo as they are merely a little more than one centimeter longer than the earlobes of a terrestrial human. Not until July 1976 did Billy purchase his first color TV unit (brand SABA) from Mr. Bär’s Bauma store, whereas the photos of Asket and Nera were taken a year earlier, on June 26, 1975. In 1991 FIGU co-founder and Core Group member Guido Moosbrugger published a book – Und sie fliegen doch! – in which on pg. 266-267 he responded to the criticism made so far by skeptics on the photos of Asket & Nera (#110 and #111). The blond women on photo #111 is not Meier’s (now ex-) wife Kalliope with a blond wig but the ET women Asket, and her friend Nera who is sitting beside her. The out-of-focus effect of the Asket-Nera pictures is not due to the radiation generated from the ET women’s bodies but by certain effects of technical nature inside the spaceship. The claim that Asket in the photo is Meier’s wife Kalliope with a blond wig is ridiculous since there is no similarity between them. even with a blond wig. The only anatomical difference between ETs and the white Earth people are the ‘strongly elongated earlobes’ which are only slightly longer than ours, about 2 cms, and which are also ‘pulled down and extended to the upper jaw bone’ as seen in two of the Asket-Nera photos. The claim that these strongly elongated earlobes would aid in a better hearing is absolutely erroneous. When it was discovered in May 1998 that the Asket-Nera photos, which Meier/FIGU had been defending so-far as real pictures of ET women, were actually photos of Dean Martin Variety Show dancers, Guido published an article – Anfeindungen in bezug auf Billys angebliche Modelle (Hostility with respect to Billy’s alleged Models) – in FIGU Bulletin 19 in December 1998, pg. 7-8. In the article he explains at length the capabilities of the ‘Men in Black’ (MIB), who according to him are behind the fraudulent Asket-Nera pictures. He also removed his 1991 rebuttal from his book and replaced it with Meier’s article that was published in FIGU Bulletin 16 (June 1998) in the later editions of his book (And yet they fly, pg. 337-343, 2001 and And still they fly, pg. 282-288, 2004). However in the 2012 German ed. of the book, Meier’s 1998 article was replaced by new information along with some of the old rebuttal from the 1991 edition, which we will address later. On May 12, 1998, research Professor Emeritus (OSU) James Deardorff (perhaps not aware of the upcoming CR 264 information which Meier only published on his FIGU website on May 14, 1998), responded to the criticism on the Asket-Nera pictures and defended them as real pictures of Asket and Nera, especially Asket. Comparing measurements of the facial features between Meier’s Asket and Michelle DellaFave, the dancer from Dean Martin show, reveals that there is a ‘distinct difference’ between them. Asket has “squirrel’s” cheeks, which show up best on the shadowed side of her face, while the D-M girl’s photo shows no sign of this. “Your measuring of heads is a bit – may I say it – daring because you do it with a photograph which is a reproduction in a book (which might be a reproduction of…) with a photograph in the Internet which is a reproduction (though very impressive, indeed) of a photograph taken of a video copy of another copy. When Deardorff finally came to know about the Meier’s bulletin article containing information (CR 264) given to him by Ptaah on MIB and photographer Schmid on May 14, he responded on May 23 by saying that one should make a distinction between what the ET contactors (Plejaren) relays to a contactee (Meier) and the facts that can be verified by us, which could be exactly opposite. The dancer from the Dean Martin show who Meier says is a look-alike of Asket is Michelle DellaFave and not Tara Leigh as stated by Deardorff (though he correctly used the photo of Michelle in his comparison). We will respond to Deardorff’s core argument on the differences later. In October 1998 German UFO researcher and journalist Michael Hesemann published an article – The Meier Case: UFO Contactee Revealed? (German text here) – in Vol. 10, pg. 64-71 of the ‘Magazin 2000plus‘ (where he worked as an editor at that time) in which he also discussed the Asket-Nera pictures. Phobol Cheng, a UN diplomat from Cambodia* claims to have seen spaceships and Meier being in contact with their pilots, especially Asket, during her stay in Asoka Ashram, New Delhi, India in 1964 when she was a child, the same time when Meier also spent several months there. The Statesman newspaper article from September 30, 1964, featuring claims of Meier’s photos and his trips in spaceships to extra-solar planets. 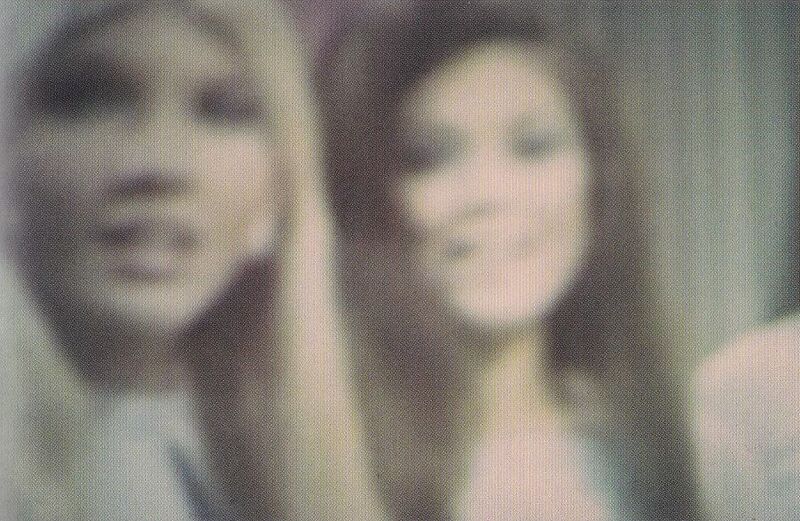 After looking at the photo of Asket in a book, Phobol Cheng claimed that the Asket in that book was very different from the person she saw who had brunette hair and not platinum blond as shown on the photo. Meier couldn’t have received the Dean Martin show on TV because satellite TV did not exist in Switzerland in 1975. Any photograph taken from a TV monitor can be identified by the cathode ray color dots, which proves ‘beyond any doubt’ that the picture was definitely NOT taken off the TV monitor. Until the controversy erupted in 1998, Meier thought that the altered hair color and discrepancy in physiognomy of Asket in the photo to the real Asket he knew was be due to the radiation and lighting on board the spacecraft that had caused the discolorations and distortions. * In this 1998 article Michael Hesemann didn’t mention the name and nationality of the 1964 woman witness from Cambodia whom he first met in 1996. He wrote “I .. made a promise to her that I would keep her name confidential and would not mention her homeland to anyone. She simply did not want the publicity due to the sensitive nature of her diplomatic position.” However Michael and Phobol Cheng seem to have either forgotten or were unaware of the fact that 4 years earlier in 1994 in a lecture presented at the International UFO Congress (IUFOC) where Hesemann was also a speaker, Wendelle Stevens already mentioned her name and nationality. And in 1995, Wendelle Stevens has published the name, nationality and even a photo of the UN diplomat in his book Message from the Pleiades, Vol 4, pg. 19-26. Phobol also brought her friend Sashi to speak at the conference. Sashi had tutored Phobol and her brother in the Hindi language, since coming from Cambodia Phobol and her brother had had to learn Hindi. Sashi reported that at the Ashram, Phobol used to talk to her briefly several times about the woman (Asket) who allegedly sang to her, put her to sleep and also about Meier. Sashi claims that she witnessed beamships hovering over the temple and also claims that one day while she was walking with Phobol, has seen geometrical patterns in the fields where a whole community of people who appears to be unaware to this alleged event, have been working with their children. This phenomenon witnessed by Sashi however seems not to have been witnessed by Phobol as she didn’t mention it nor acknowledged it in her testimony. Was Sashi hallucinating? Also refer to Zeugenbuch, 2001, pg. 9-23 for Phobol’s written testimony. 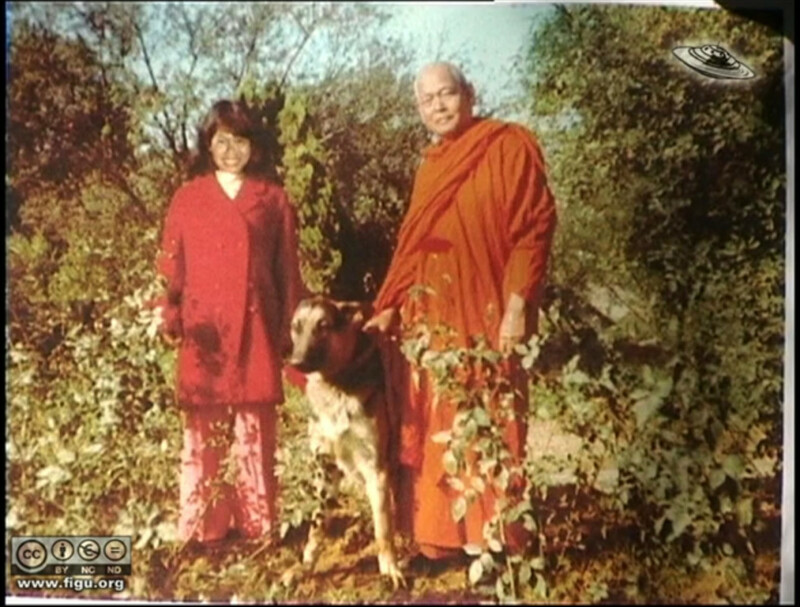 In a 2001 interview with Michael Hesemann, Phobol says that she was the only person who could see Meier and Asket walking around in the Ashram; not one person among many who were walking nearby were able to see Asket, not even her maid to whom Phobol pointed out where to look. She further pointed out that the head gardener of the Ashram might have seen them walking but she was not sure if he had really seen them or whether he just reported what Meier had told him. In her 1999 video lecture given at IUFOC, Phobol claims that a journalist from ‘The Statesman’ newspaper was dispatched to interview Meier on his UFO sightings. She claims that the journalist had interviewed a lot of eye-witnesses, met Meier and was shown his beamship photographs. Indeed a journalist named S. Venkatesh (expired in 2009) was dispatched to cover Meier’s story but nowhere in his 1964 article was there any mention of eye-witnesses being present, thus raising doubts on the reliability of Phobol and Sashi’s testimony which really is a recollection of events that happened 35 years ago, especially at a time when Phobol was 8-years old and her brother 6-years old, the years when children’s minds are easily malleable and highly susceptible to their own or outside influences giving rise to false impressions or memories. All of the above information casts doubt on the accuracy and reliability of Phobol and Sashi’s testimony regarding events that happened more than three decades earlier when Phobol was only 8 years old. The fuzzy photo of Asket, a DAL, was taken inside the ship in a room only about 10 feet wide, and well inside the jammed focus ring adjustment on Billy’s broken camera, thus the “fuzzy” out of focus reading. As for the alleged, and never supported story that she was first a German Fashion Model, then Billy’s brunette wife in a blond wig, and then finally one of the dancer’s in Dean Martin’s program, all were quickly dispensed with by video split-screen imaging, where all can see that the faces simply do not match any of those allegations. That should have been done by the proponents first, but of course they all knew better and did not need/want such technology to interfere with their cute judgments. All should do their own homework before making such silly allegations, or even accepting such. 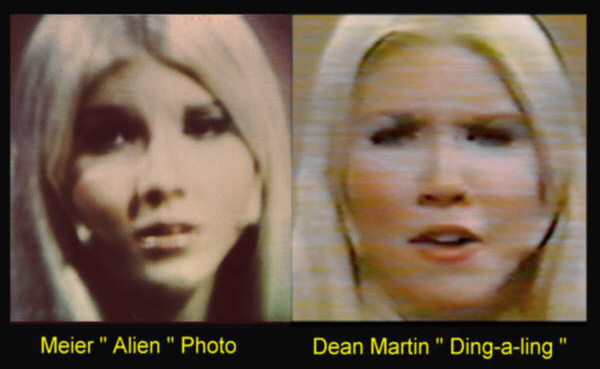 During his 505th contact with Ptaah on November 18, 2010, Meier shows him a comparison picture between his Asket photo and a photo of the Dean Martin Show dancer he got from the internet and asks for his assessment. Perhaps he was prompted by James Deardorff who also cited the same comparison picture on his webpage in 2008 and somehow concluded that the person on the left is the real Asket and the person on the right is the Dean Martin show dancer. Ptaah claims that he only mentioned to Meier in 1998 that photo with Asket & Nera (#111) has been forged and not the ‘Asket-only’ picture (#110), and also that he never bothered to compare Meier’s photos with the look-alikes from the Dean Martin show, until Meier showed a comparison picture between his photo #110 and the dancer to him for the first time on November 18, 2010 during the 505th contact. The person on the left in the comparison picture is ‘obviously Asket’ while the person on the right is the dancer who ‘only has some similarity’ and can’t be called a look-alike and any such claims are ridiculous. Asket has a long and slim neck, while the dancer has a short and thick neck. The hair color of Asket in Meier’s picture is originally darker and has been manipulated into white-blond in order to make it appear like that of the dancer’s hair as seen in the comparison picture. After listening to Ptaah’s remarks on the significant differences between the women in the comparison pictures, Meier now claims that the women in his photo #111 published in Guido’s book aren’t Asket and Nera and he asks Ptaah to clarify this for him. Ptaah then says to Meier that it will take some time for him to ‘very precisely’ analyze and clarify the issue. Then in Meier’s 515th contact on March 7, 2011 Meier shows Ptaah an article published by Luc Bürgin in the March/April edition of the Mysteries magazine. After reading the article Ptaah blames the author of the article for publishing ‘crazy stupid fantasies, untruths and misrepresentations’, and the conversation continues with more negative remarks by both Ptaah and Meier directed at the author of the article and those who believe the content posted in the article and in the magazine in general. During Meier’s 526th contact on August 17, 2011, he shows Ptaah a document containing a translation by Core Group member Willem, of a text related to the Asket-Nera topic from a 2009 YouTube video titled ‘Billy Meier – Why the UFO Case is NOT a Hoax!’, which was downloaded for Meier by Core Group member Patric Chenaux. This document contains the same arguments that already have been put forth by Meier, FIGU and their supporters more than a decade ago in 1998, and no new arguments exist. The photographer Schmid has joined the pictures of the dancers with the pictures of Meier’s original Asket and Nera together and falsified them. In order to destroy Meier’s mission, the MIB pre-determined in 1975 that ‘several unstable adversaries and boasting and high-handed persons’ (like Kal Korff and Luc Bürgin, among others) should in the 1990s notice the American revue dancers respectively the look-alikes of Asket and Nera and thereby destroy Meier’s credibility. Until Ptaah’s latest research, Meier and the FIGU members thought that Meier’s pictures of Asket and Nera had simply been exchanged with the pictures of the dancers. Meier’s picture #110 with only Asket has not been exchanged but was falsified by changing the her original dark hair color to blonde, in order to make her look like the dancer. The women shown on the photos #109, #110 and #111 are not Asket and Nera but the two American look-alikes who are performing as singers in a dance group, as was already mentioned by Ptaah in CR 39. Under the pressure of the MIB, photographer Schmid has taken individual still photographs of a TV show of the Asket & Nera lookalikes and copied them Billy’s original photographs. After becoming aware of these falsifications in May 1998, the photographs #109, #110 and #111 are still being sold by FIGU, but are correctly identified as photos of the American lookalikes of Asket and Nera. Photo #110 is really a falsified picture that doesn’t show Asket but an American look-alike, a singer from a dance group as already described by Ptaah in CR 39. Sections from single frames were copied from a TV show, in which the look-alikes of Asket and Nera performed as singers of a revue dance group, and were copied into Billy’s original photographs #109, #110 and #111. This seems to reflect FIGU’s 1998 position on the Asket-Nera photos, so perhaps this rebuttal was written before CR 505 and CR 526 were available and wasn’t corrected before the publication of Guido’s book in 2012. By now it must be clear there are many discrepancies, flip-flops and internal contradictions present within the information published by Meier and FIGU members themselves over the years regarding these Asket-Nera pictures, which even today doesn’t convey a coherent, rational explanation even if one ignores the fantastic claims in it for a minute. Meier/Ptaah (CR 39, December 3, 1975) – There are American look-alikes of Asket and Nera who also happen to work together. Meier/Ptaah (CR 264, May 14, 1998) – All of Meier’s photos #109, #110 and #111 show American look-alikes of Asket and Nera. Meier/Ptaah (CR 505, Nov 18, 2010) – Meier’s photo #110 shows the real Asket, but the hair color has been manipulated from brunette to blonde to make her look like her American look-alike. 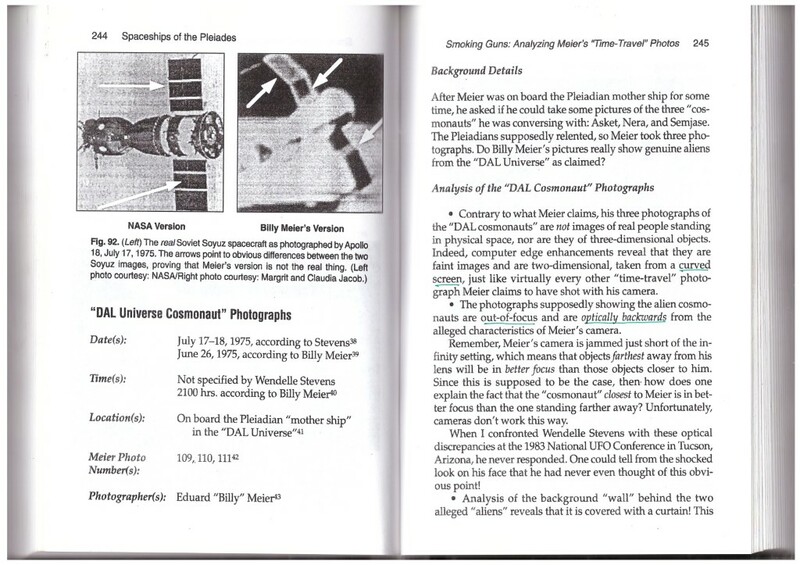 Meier/Ptaah (CR 526, Aug 11, 2011) – Meier’s photos #109 and #111 are falsified by joining Meier’s original pictures with the original pictures of the American look-alikes. HGL (AZJ, pg. 8, 2011 and USFD, pgs. 337-338, 2012) – Meier’s photos #109 and #111 are exchanged with the pictures of the dancers and these were ‘not extensively falsified.’; photo #110 shows the real Asket with manipulated hair color. HGL (article from May 1998; AZJ, pg. 10, 2011 and USFD, pgs. 340-341, 2012) – All of Meier’s photos #109, #110 and #111 show American look-alikes of Asket and Nera that were copied into Meier’s original photos. Guido (USFD, pgs. 343-344, 2012) – All of Meier’s photos #109, #110 and #111 contain American look-alikes of Asket and Nera that were copied into Meier’s original photos. Meier/FIGU’s explanations on how the photos #109, #110 and #111 have been falsified are very confusing and different to the explanations given at different times. Were they falsified, exchanged/replaced with the TV frames, or were they merged with the TV frames? This is considered relatively a very minor issue when compared to the explanations made on the authenticity of Meier’s photo #110. Does Meier’s photo #110 depicts the real Asket only with the hair color changed from brunette to blonde? Or is that photo either exchanged/replaced or merged with the TV frame and falsified? Both James Deardorff and Meier/Ptaah (CR 505) argue that there are significant differences between the two women in the below comparison picture and conclude that photo #110 (left) is an authentic picture, though Meier/Ptaah argue that the hair color has been changed from brunette/dark to blonde by the photographer Schmid under the instructions of the MIB. Deardorff (2008): The face of “Asket” has a narrower chin, lack of an indent at the top of the nose between the eyes, and a lower hairline above the forehead. Ptaah/Meier (November 18, 2010): Shape and fullness of the face and that areas of mouth, chin and eye are ‘recognizably different.’ Asket has a long and slim neck, while the dancer has a short and thick neck. It is baffling that Ptaah, who in 1998 declared that photo #110 (and the other two photos) depicts an American look-alike, in 2010 switched his position, citing bizarre, spurious reasons (which we will see below), to exactly the opposite – which is that photo #110 is a genuine picture of Asket, although he claims that the hair color is manipulated from the original brunette to blonde. 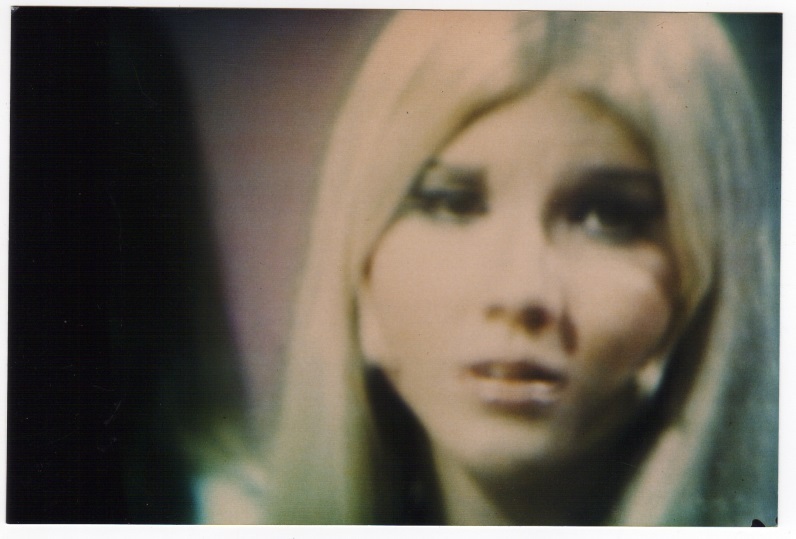 The main obvious flaw with the Deardoff/Meier/Ptaah’s analysis is that they either deliberately or not, chose a picture of Michelle DellaFave that is totally from an unrelated scene taken from one of the episodes from Dean Martin Variety Show from 1970, where she portrays a different expression under different lighting conditions, for the comparison. Moreover there are considerable differences in the quality (right image is obviously photographed from a CRT monitor) and perspective (aspect ratios, camera angles, etc.) of the images which makes any efforts of a legitimate comparison by juxtaposing the images futile. However the fact, which Deardoff/Meier/Ptaah seems to have carefully ignored, is that since 1998 skeptics have presented a video excerpt of ‘Welcome to my world’ medley from the Dean Martin’s Christmas Special video from 1970, where both Meier’s “Asket” and Michelle DellaFave look almost the same. 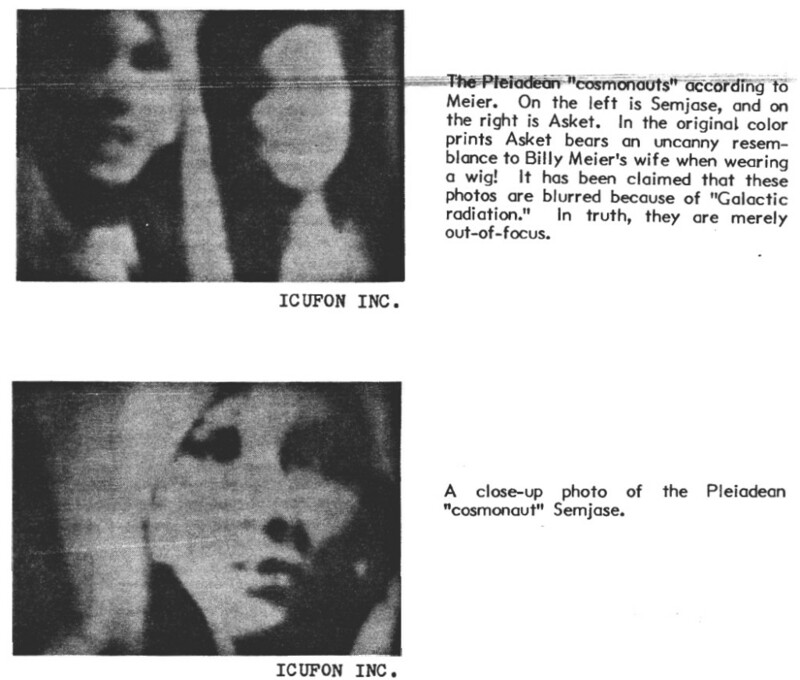 Even the alleged American look-alike of Asket, Michelle DellaFave has stated in unambiguous terms that the person in the Meier’s photo #110 (left in the comparison image), including the photos #109 and #111, is no one else but her and noted that her snapshot ‘might belong to the year 1971′, when she used to wear curly strands to both sides of her face. When we posted the same photo #110 on the official ‘The Original Golddiggers‘ page on facebook on May 21, 2015 and asked whether she is Michelle DellaFave, they have affirmed positively on the same day. Indeed the person “Asket” in Meier’s photo #110 looks the same as Michelle DellaFave, as can be verified from the following snapshot taken from Episode 170 of Dean Martin Variety Show video originally aired on February 25, 1971. One can also refer to the picture shared by Michelle with the professional skeptic Derek Bartholomaus. Furthermore there is no real difference in the shapes of the chin in both images at all and the only reason for the apparent appearance of the ‘narrower chin’ in the left image is due to the fact that the Meier’s photo #110 represented on left in the comparison image is of very poor quality with most of her lower-right side of the face seen in a more darker shade thereby hiding aspects of chin, cheek and neck, which however is not the case with the original picture, which ironically has been sold/published by Meier/FIGU themselves as genuine (and still is). Note (July 15, 2015): Refer to the comments section of this link for the rebuttal of some of Rhal Zahi’s pro-Meier conclusions on Asket-Nera photos. But in his book Und sie fliegen doch! (under Point 2 in both the 1991 and the 2012 edition), Guido Moosbrugger mentioned that according to Billy ‘the extraterrestrial women, at least those he has got to know, only use colored eye lenses and possibly colored head hair, if at all. All other claims belong in the realm of fantasy.’ This not only contradicts what has been reportedly told to Wendelle by Meier in 1978 but also negates the clear indication of women wearing make-up in Meier’s photos. According to Meier, the hair color of the Plejaren woman Semjase is light-blond. But in the Meier’s photos #109 and #111 and probably in #110 (assuming she is Semjase), we see her hair to be neither blonde nor brunette but dark or black. This glaring fact seems to have been, either deliberately or not, ignored or never commented upon by Meier before and after 1998, when skeptics have revealed that the women in the pictures are not ETs but dancers from Dean Martin Variety show. 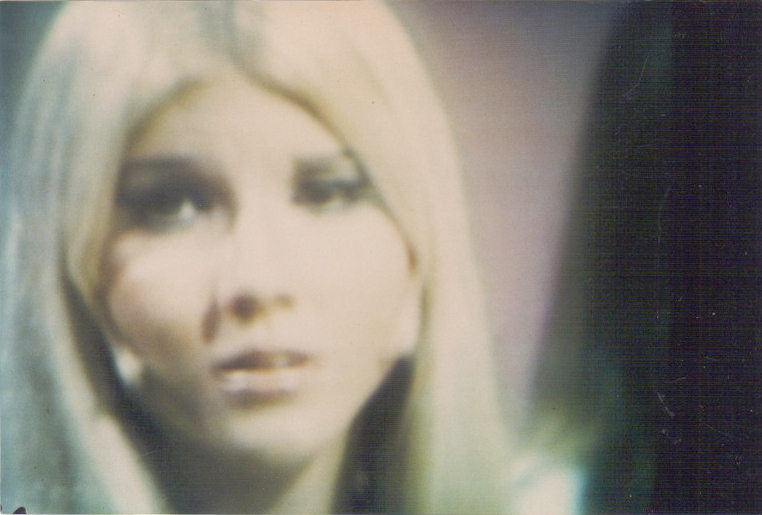 Meier’s photo #109 appears to be a photograph of a transition frame from TV, where the frame is fading from one scene containing either the three women or Dean Martin, to the other. In the right photo, after digitally masking the woman’s face, one can notice the face of Dean Martin wearing a red sweater on a white shirt. It is unbelievable to imagine that MIB, claimed by Meier/Plejaren to be the most powerful group on Earth with unfathomable resources, would slip such an easily noticeable forged photograph into Meier’s collection, even after allegedly taking several months for manipulation, in order to discredit him decades later. Also equally unbelievable is the fact that since 1975 (and at least up to 1985), the Plejaren ETs have failed to detect it as an image containing two different TV frames overlapped on each other. And even to this day, both Meier, FIGU and Plejaren have never commented on this transition frame aka photo #109. 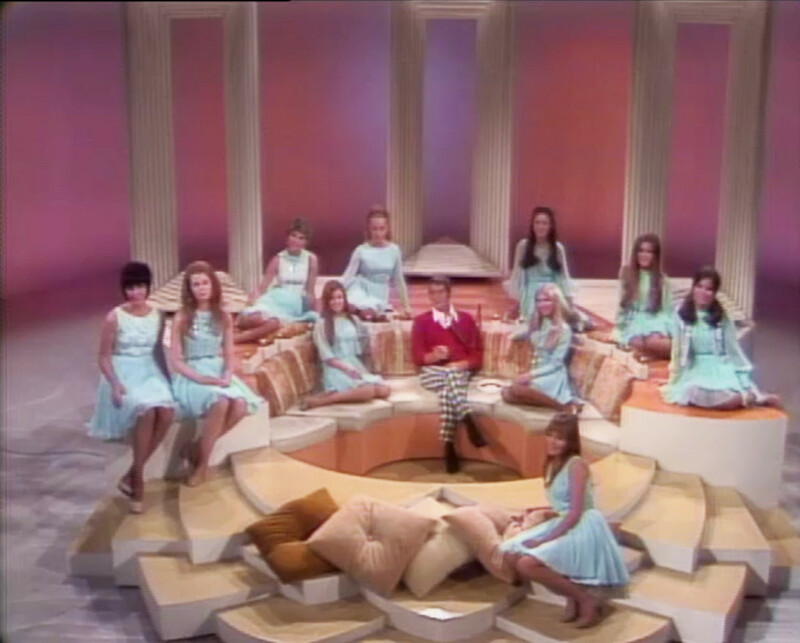 This composite frame likely is taken from an episode of Dean Martin Variety Show, where Dean wears a red sweater on white shirt while the dancers in blue dress just like the other two Meier’s photos #110 and #111. Below images suggests that there could be two other episodes that has these same details (see below image) from which either #109 or all of Meier’s pictures could have originated. HGL in his 1998 bulletin article states that since Meier only bought his color SABA TV in 1976, he couldn’t have photographed the dancers from the TV show in 1975. Even if that is true, it is not necessary for a hoaxer to possess a color TV right in his home to create forged photographs from TV. He could have gotten them from any of his accomplices who could be from anywhere in the world, in possession of a color TV and the Dean Martin show broadcasted to their locations. Michael Hesemann on the other hand claims that Meier couldn’t have received the Dean Martin show on TV because Satellite TV did not exist in 1975 in Switzerland. Here Hesemann assumes that show was broadcasted in 1975 which is not true. The Dean Martin Variety Show episodes with Michelle DellaFave as one of the Golddiggers with her curly hair strands, sitting around Dean Martin and singing ‘Welcome to my world’ medleys was broadcasted only in the years 1970-1971. And Meier or his accomplices could have gotten the frames from a color TV when the show had several reruns in Europe in the 1970’s, as also had been suggested by Michelle DellaFave to Derek Bartholomaus. Earlobes vs Curly hair locks? In his 1991 ed. of Und sie fliegen doch!, Guido under Point 4, acknowledged the claim made by D. (Jim Dilettoso) on the earlobes of ET woman seen in two of Meier’s photos having been ‘come way down and attach onto the jawbone’. However he refuted Dilettoso’s argument by saying that those elongated earlobes (about 2 cms) has nothing to do with a better hearing. But in 1998, after the skeptics revealed that Meier’s photos of Asket-Nera have come from the Dean Martin show, in his June article on the topic of earlobes, HGL responded by saying that the earlobes ‘are actually the small curls of the revue dancers since Asket’s earlobes cannot be seen on the photo as they are merely a little more than one centimeter longer than a terrestrial human’s.’ This contradicts all earlier explanations given by FIGU (stated either explicitly or implicitly) on the earlobes. The contradictions don’t stop there! On the earlobes topic, the 2012 ed. of Und sie fliegen doch! retains the same information as the 1991 ed. thereby contradicting HGL’s above explanation from June 1998. In CR 505 (Nov 18, 2010), Meier claims that based on “more precise” latest investigations in the past conducted by Ptaah, it is revealed that the color of hair of Asket in Meier’s picture is originally darker and has been manipulated into white-blond in order to make it appear like that of the dancer’s hair as seen in the comparison picture. If Asket’s original color is darker, then why did Meier claim and publish it as blonde in all of his earlier publications? Here we have Meier in 1995 claiming that the blonde color of Asket is due to a herbal concoction applied by Asket that changed her hair color from brunette to blonde. But in 1998 Michael Hesemann’s article, also approved by Meier/FIGU, he totally ignored Meier’s 1995 medical explanation for the change in color and instead seems to have cherry-picked only a part of Phobol’s testimony in order make Meier appear as a victim thereby supporting MIB-theory. I refer to a video “The Reopening of the Meier Case” (1999), starring Methusalem Meier, Michael Hesemann, Wendelle Stevens & Phobol Cheng. During the presentation, Phobol Cheng described what she knew about Asket. She remembered that Asket has “long dark hair”, golden skin, around 5ft1, did not have a typical European look but a mixture of European and Asian. She recognized immediately that the girl was not Asket when someone showed her the forged photos. If her impression about Asket is accurate, then all those forged photos about Asket and Nera were too badly made, we don’t even have to compare their hair lines, because the girls in the photos are “blondes” and are typical Europeans. My question is: If Phobol Cheng’s description about Asket is accurate, that the difference between Asket and the dancing girl is so apparent, was it due to your extremely poor physical condition and faded memory at that time, that it was not possible to recognize this right away as Phobol Cheng did? The difference wasn’t so great (in Billy’s memory). During her lecture given on the International UFO Congress in 1999, Phobol Cheng mentioned unambiguously that the Asket she met in 1960’s at Asoka Ashram certainly doesn’t look like an European Caucasian but as a blend of both Caucasian and Asian. This distinction made by Phobol contradicts Meier’s description of Asket. It appears as if they both saw two different women, if they have seen one at all. One more interesting point to think about is that – Meier who allegedly has been in contact with Asket for decades since 1953 was somehow unable to distinguish her while Phobol Cheng who only according to her, spent only a small time in a span of a couple of years was able to recognize the woman in the photos as not being Asket but some other person. Not to mention perhaps the greatest absurdity of all is that the Plejaren Ptaah, Semjase and Quetzal happened to have verified and approved (see CR 260 and FSB 20) Asket-Nera photos as authentic since 1975 and allegedly at least up to 1985. 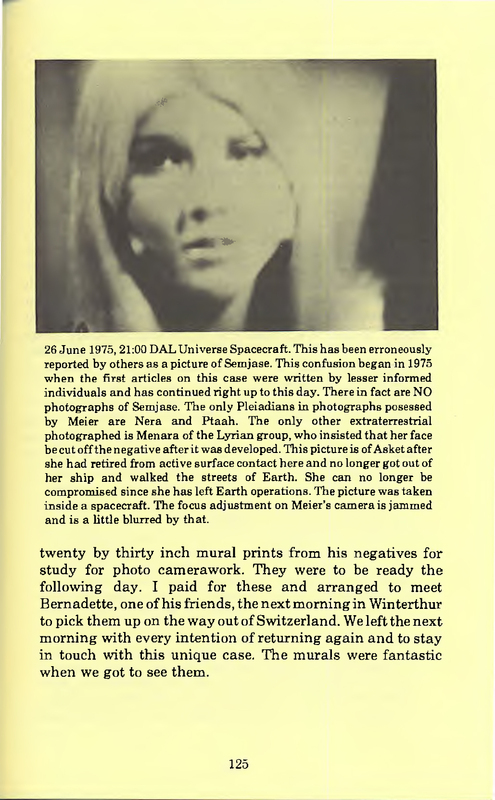 We have documented the investigation skeptics conducted on three of the Meier’s pictures (#109, #110 and #111) which he, since 1975, claimed to be genuine photos of extraterrestrial women captured on camera inside a spaceship in a parallel Universe, DAL. The women in these pictures, skeptics revealed in 1998, turned out to be dancers/singers from the Dean Martin Variety Show originally broadcasted between 1965-1974. Soon after this exposé was published, Meier claimed that the ETs have already informed him about the fake pictures forged by MIB, several years earlier in 1985 but which due to his health reasons totally forgot about it (and also the ETs ignored it since then assuming that Meier had taken care of it), until only that time when skeptics exposed them as fakes. In our investigation we found out that again since 2008 and 2010 – even after skeptics demonstrating and Meier/FIGU themselves admitting that since 1998 that the women in Meier’s photo are none other than the dancers/singers from the Dean Martin show, with even the dancer/singer Michelle DellaFave stating since 2007 that the “Asket” was indeed her in all of Meier’s pictures – Meier/Ptaah and his supporters allege that the woman in Meier’s photo #110 is not Michelle but the real ET woman Asket (albeit with a different hair color). We also have uncovered plenty of outright contradictions and flip-flops among the claims made by Meier, witness Phobol Cheng and his supporters over the years. All of the above analysis strongly suggests that Meier very likely had never photographed any ET women in the DAL Universe, as he claims to have done.